when you stay with us. Book directly & get awesome benefits ! So much comfort and friendly service at a budget price! I highly recommend this hotel for an airport layover, but also a wonderful experience! 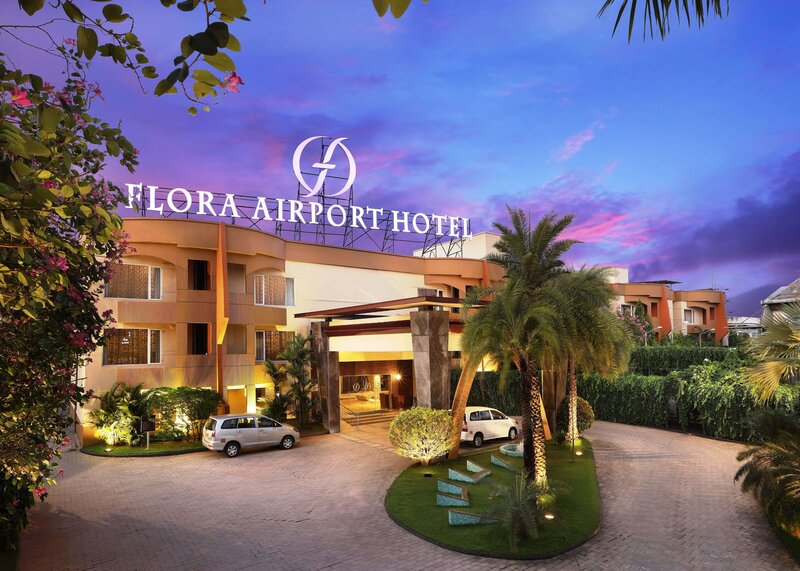 Located 100 meters from the Cochin International Airport, the Flora Airport Hotel Kochi is a conveniently placed 4-Star property and features modern rooms. The hotel is suitably connected to the highways, railway stations and close to the business district 'Kochi'. The hotel offers 60 centrally air-conditioned rooms and suites featuring modern interiors and furnishings. Each elegant room is ideal for the corporate travelers and families alike. The rooms are fitted with LCD Television with Satellite Channels, High Speed Wi-Fi Internet Connectivity, Work Desk, Direct Dial Telephone, Electronic Safe Deposit Box, well stocked Mini Refrigerator, Tea/Coffee Maker and En-Suite Bathroom. For leisure, the guests at the hotel can exercise at the well-equipped fitness centre or enjoy a dip in the outdoor swimming pool. Recreation facility includes a steam room and spa with Ayurvedic, Thai, Balinese treatments, Hot Stone and Aroma Therapy. The dining options include a multi-cuisine and a Mediterranean restaurant apart from the lobby coffee shop. Also located within the premises is the 'Food Circle' Food Court offering a choice of fast food and snacks 24 hours. Meeting facilities in the hotel includes 02 Boardrooms with video conferencing systems. The banquet hall has a capacity of 1200 pax with theme lighting and live internet streaming. The hotel also provide free shuttle service to the airport. The hotel offers 60 rooms featuring modern interior and furnishings. Each elegant room is ideal for the corporate travellers and families alike. Elegant rooms with guest comfort and a king size bed. Elegant room with guest comfort and a twin bed. Spacious suite with en-suite bathroom and a living area. Special touches include fruit platter, well stocked refreshment centre, local newspaper & upgraded bathroom amenities. This hotel ensures that every facilities that the guests desire are always available for their ultimate comfort. Enjoy a memorable dining experience at our various choices of food and beverage outlets. The multi cuisine restaurant with daily buffet breakfast, lunch and dinner that can seat 36 pax. Located at the lobby level and is open during the buffet timings. Food court located within the hotel premises and caters with a choice of fast food including American Fried Chicken, Arabian Grills, Kebabs, Tikkas, Pizzas, Pastas and Burgers. Offers selection of coffee and tea with a wide variety of snacks and deserts. The Mediterranean Restaurant located on the first floor and serves a selection of favorite Arabic, and International Cuisine. Our banquet specialists can provide expert guidance on every aspect of your event planning. From menu selection to table layouts, decorations and entertainments, we have the expertise to make your event a success. Our chefs will create a dining experience according to your exact specification, offering you a huge range of options in your choice of cuisine. Flora Airport Hotel features nine magnificent banqueting venues that can accommodate up to 1500 guest; halls are equipped with modern facilities including video conferencing. Choose Flora Airport Hotel Kochi to make your special event a successful and memorable experience. Why choose Flora Airport Hotel Meetings And Event Space? For leisure, the guests at the hotel can exercise at the well-equipped fitness centre or enjoy a dip in the outdoor swimming pool. Recreation facility also includes a jacuzzi, steam room and spa treatments. Flora Kochi Airport Hotel boasts an advanced cardio equipments and a wide variety of free weights with an array of the latest in strength training equipment. This spa provide a serene and truly unforgettable experience of pure pampering and relaxation in exquisitely beautiful surroundings, using holistic therapies and massages which combine the very best of Eastern and Western practices. Recreation facility includes a steam room and spa with Ayurvedic, Thai, Balinese treatments, Hot Stone and Aroma Therapy. Near Al Rigga Metro Station, Deira, Dubai, 120328 U.A.E. Near Mall of the Emirates, Al Barsha, Dubai, 8088 U.A.E. Airport Road, Dubai, 125275 U.A.E. Near Deira City Centre, Deira, Dubai, 119062 U.A.E. Near Deira City Centre, Deira, Dubai, 114166 U.A.E. Exit from the International Terminal will lead to the first roundabout. Drive straight from the roundabout and you reach the T junction. The Flora Airport Hotel entrance gate can be seen to the right of the T junction. Exit from the Domestic Terminal will lead to the first roundabout. Take a left turn and reach ahead for the next roundabout. Turning right will reach you to the T junction. The Flora Airport Hotel entrance gate can be seen to the right of the T junction. This hotel ensures that every facilities that the guests desire is always available for their ultimate comfort. © 2019 Flora Hospitality™. All Rights Reserved.